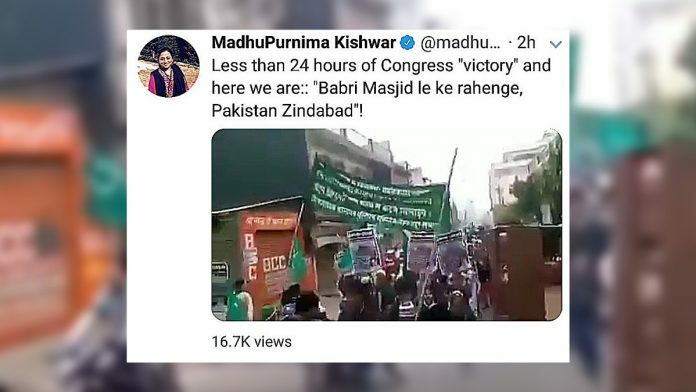 The video was actually filmed two years ago in UP’s Sambhal district, many Twitter users slam Madhu Kishwar for spreading ‘fake news’. New Delhi: A two-year-old video, in which a group of protesters can be heard shouting “Babri Masjid le ke rahenge” (No rest until we get Babri Masjid) during a procession, is doing the rounds on social media. 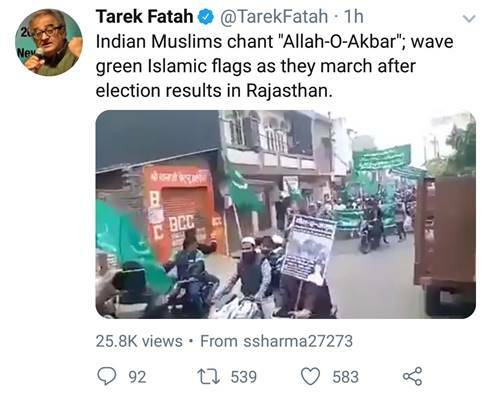 Academic and writer Madhu Purnima Kishwar and controversial Canadian author Tarek Fatah are among those who shared the video on Twitter, claiming it was filmed in Rajasthan after the Congress party won the state elections Tuesday. However, the video was actually filmed two years ago in Sambhal district of Uttar Pradesh, where communal tension had been on rise for some years. It shows a group of people taking out a procession carrying Islamic flags. The video was uploaded on YouTube on 6 December 2016, and clearly says that the procession was taken out in Sambhal, UP. A number of fake videos have surfaced on social media platforms such as Twitter and Facebook since Congress’ victory in the three assembly elections earlier this week. Her post has been retweeted by almost 4,000 users and has been liked more than 4,000 times as of Friday morning. Fatah’s tweet was posted Thursday morning and has received more than 1,700 retweets and almost 2,000 likes so far. However, there are some Twitter users who have questioned the authenticity of this video as well. Senior journalist Dilip Mandal has gone to the extent of demanding Kishwar’s arrest for spreading what he calls “fake news”. @Uppolice must arrest her. She knows this is fake. Another Twitter user has drawn the attention of the Delhi Police by alleging that Kishwar is trying to fan communal sentiments with “fake news”. @DelhiPolice pls note this person is trying to incite roits with fake news.